Just hours into yesterday’s launch of the iPhone 4, reports began to pour into tech blogs about major screen and reception issues with the new device. Gizmodo’s running tally of confirmed reports of yellow spots and bands from iPhone 4 owners has topped 55 (and counting), with similar reports on message boards over at MacRumors. A more common and problematic issue however, has been a reduction in mobile reception when you grip the device in a particular way. 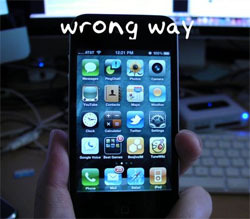 Left-handers have been particularly annoyed by the fact that holding the iPhone 4 in a natural way apparently places pressure on the antenna band, which is situated on the bottom left of the device. Bridging the gap or notch in the band with your skin results in attenuation of signal strength and can lead to dropped calls or poor call performance. 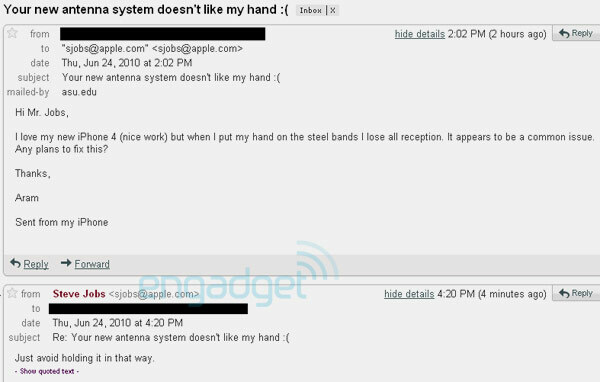 Responding to an email from a frustrated new iPhone 4 owner, Engadget have published the following screenshot of Steve Jobs reply – “Just avoid holding it in that way”. With the suggested solution to the reception problems being the purchase of an Apple iPhone 4 bumper case, which creates a barrier between the users hand and the antenna, customers may have to shell out $29.99 to fix a problem they didn’t know existed when they bought the phone.